Nutrition Week and Ganesha come together this time!! What a coincidence! 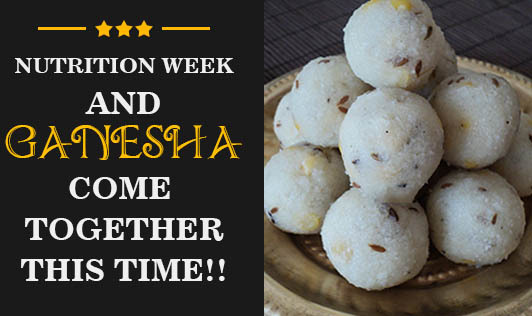 Nutrition Week and Lord Ganesha (who loves food) have come together this time! Nutrition week is celebrated from 1st to 7th September every year. Let us together make a resolution on this auspicious occasion that we would celebrate the entire year as a Nutrition Year and eat healthy, and so Live Healthy!! Eating healthy will include all the sweets prepared during this festival, but living healthy will also include burning those calories immediately! So go hit the gym or the jogging track first thing in the morning, and you can enjoy all the sweets without feeling of guilt. Have a Happy and Healthy Ganesha festival and Nutrition week... oops... Nutrition Year! !